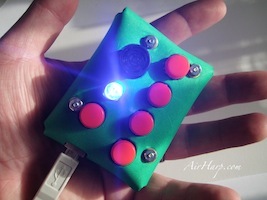 AirHarp - An open source gestural autoharp! An open source gestural autoharp! 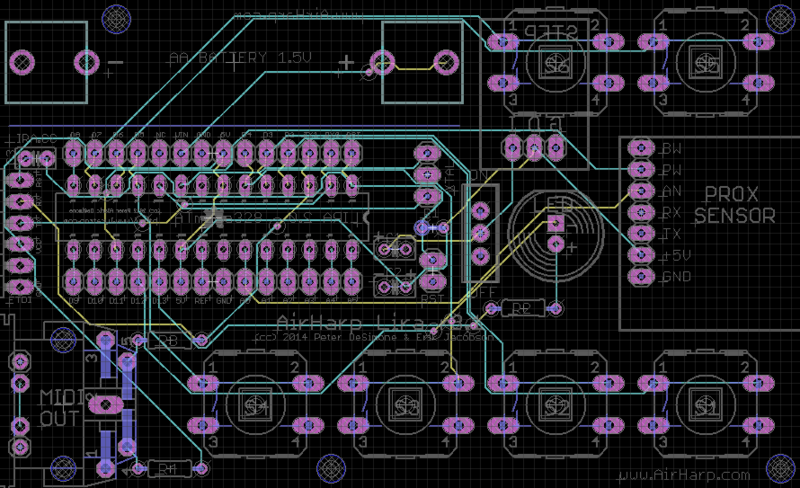 As seen on Synthtopia, SparkFun Electronics and Ask an Engineer with Limor "Ladyada" Fried! The AirHarp is a type of digital autoharp that allows musicians of diverse skill levels to play music of advanced harmonic complexity simply by pressing four pushbuttons and "strumming" invisible harp strings in the air. 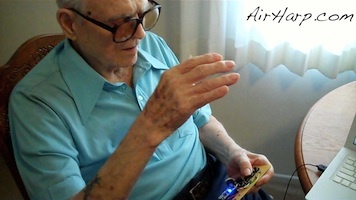 Developed by musician-turned-engineer Peter DeSimone, the AirHarp is pocket-portable and suitable both as an introductory instrument and an accompaniment tool for singers and songwriters. It allows direct access to fourteen chords within a given key (including the seven diatonic chords), and can automatically transpose to any key with the push of a button. This allows the AirHarp to easily play most songs, from baroque arias to modern rock songs. 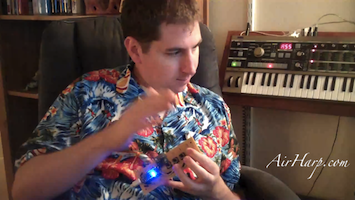 As a "plug and play" USB MIDI controller, your AirHarp can sound like any instrument in existence. With thousands of software synthesis ("softsynth") sound banks available today, you will always be discovering new sounds to make with your AirHarp. All the sounds you hear were played on the AirHarp with the exception of the drum tracks, which are canned samples. I could have used the AirHarp for the drums as well, but I'm no percussionist and I have trouble conceptualizing music in purely rhythmic terms. Thus I will leave the exploration of the AirHarp's percussion capabilities to someone else. The AirHarp emits a beam of ultrasound that's undetectable to the human ear. It bounces this beam off your free hand to determine the distance between your hand and the device. This is a form of ultrasonic sonar ranging. A microcontroller continuously monitors the output of this sensor, along with the status of each pushbutton. Calculations are performed to decipher the coded chord input and compute the desired note pitches based on readings from the ultrasound. A list of active notes is maintained and used to determine which notes to turn off and when. Information on which notes to activate and deactivate is coded into a serial data format called MIDI and transmitted out of the microcontroller into either a synthesizer module or to an outboard computer through a USB cable. The synthesizer module or computer then converts these "note on/off" commands into audible sound. Instruments and kits are available now from the Lyratron store! All harps are currently hand assembled by Peter DeSimone. We are actively seeking business partners who can help us bring the AirHarp to a larger audience.